Home » Everyday , Health » HERE’S WHY YOU SHOULD EAT CUCUMBER AS OFTEN AS YOU CAN, SOME HEALTH BENEFITS! HERE’S WHY YOU SHOULD EAT CUCUMBER AS OFTEN AS YOU CAN, SOME HEALTH BENEFITS! Cucumbers are a healthy addition to your diet. Not only are they naturally low in calories and fat-free, they are full of essential nutrients to improve your health. Whether you add cucumber slices to your salad, toss diced cucumbers in your smoothie or snack on them in the afternoon, cucumbers help keep you full without ruining your diet. A full 2-cup serving of cucumber slices, which weighs slightly more than 200 grams, has about 30 calories. Virtually all of the calories come from carbohydrates, a macronutrient that is the main source of fuel for your entire body. A trace amount of calories come from protein and fat, but the total calories from both combined is less than 2 calories. The key to getting rid of cellulite requires a large intake of water on a daily basis. Since cucumber is mostly made of water, consuming this vegetable helps your body to eliminate toxins. Also eating cucumbers on a regular basis can help battle kidney stones. No one wants to have bad breath. But how can you prevent it from happening? It’s simple. Brush your teeth regularly, and eat plenty of cucumbers. It helps in killing off the bacteria responsible for your bad breath. All you have to do is hold a piece of cucumber in the mouth for about 30 seconds. You may look a little silly while doing it, but trust me the end result it worth it. Because cucumbers mainly consist of water, it means that it also contains most of the vitamins needed by our body. The cucumber’s peel is high in vitamin C and contains 10 percent of the recommended daily dose. Cucumbers are a rich source of vitamin B, along with vitamin B1, B5 and B7. These vitamins are known to be effective in controlling feelings of stress and anxiety. Cucumbers contain pottasium, which is associated with lower blood pressure levels. A proper balance of potassium both inside and outside your cells is crucial for your body to function properly. Cucumber is mostly made up of water and fiber. These are excellent to help your system digest better. Even Cucumber skins contain insoluble fiber which helps food to move quickly through your digestion tract. Apart from the above benefits, consumption of cucumber is also known to be good for your skin and hair. It rehydrates the skin, cleansing it thoroughly and eliminating the outbreak of pimples and acne. It’s also beneficial for the hair, as it gives it a shiny and lustrous look. Cucumber can be eaten in a variety of ways. They can be sliced, diced, juiced or added in a salad. 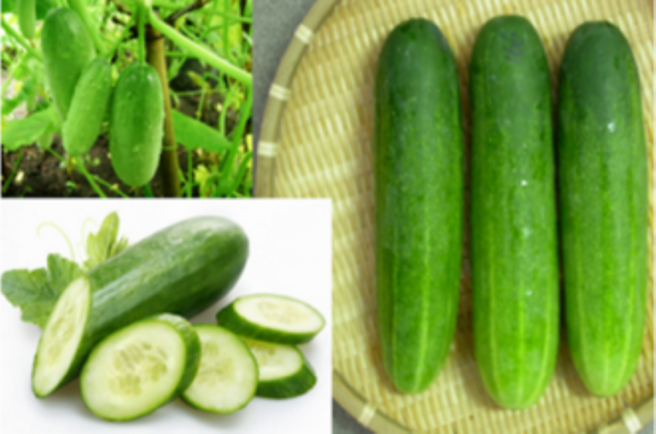 It is recommended that the skin of the cucumber should also be consumed for better health benefits.